Take the Mystery out of your Customer Evaluation program we have 20 years experience secretly shopping companies of all types. Understand and manage your customers experience to build customer retention and guest loyalty. Mystery Shoppers Service, Satisfaction Services has been providing mystery shoppers, customer service evaluations and mystery shopping programs to improve customer service and guest loyatly for 20 years. We provide mystery shopper services, quality and service evaluation programs to some of the top retail, restaurant and hospitality companies worldwide. We believe we constantly deliver the most objective, comprehensive and timely mystery shopper evaluations, guest surveys and reporting available. The commitment we have to finding and training "mystery shoppers" for your concept is unsurpassed and is obvious in the end product you receive. We also provide you with aggregate monthly, quarterly and year to date reports that give you the ability to identify the steps of service by location as well as the areas where you may have opportunities. The more frequent the mystery shopper visits, the higher degree of focus on the program and scores are kept high and consistent. All of our clients use our program to reward staff and management, along with traditional profit and loss reward systems. This keeps the focus on the quality side of the business as well as the profit side. We both know satisfied customers create frequency and motivate others to visit, saving you marketing dollars on creating trial. 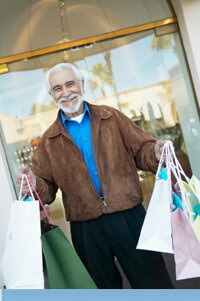 We assign mystery shoppers based on our clients' profile and have an extensive database of mystery shoppers nationwide. We will customize your evaluation and training material based on your criteria. 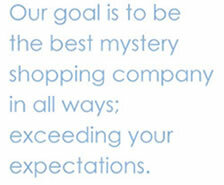 Our mystery shopping programs are completely tailored for your business. Mystery shops / evaluations are available to you within twenty four hours. We take great pride in the fact that we strive to provide the highest quality quality and service evaluations' or "mystery shopping" available.